Thirty-six seed ports means more happy Finches in your backyard! 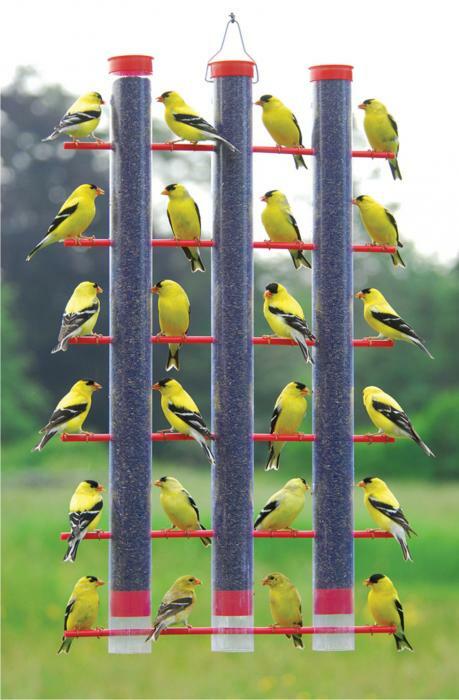 Unique 3-tube design allows up to 24 Finches to feed at once with all birds in view! Maintains seed to more ports 66% longer! Holds 3 lbs. Plastic tube, red plastic caps and perches. 25 inch tall, 14.25 inch wide, tubes are 2 inch diameter. Made in China, Assembled in the USA. I counted 15 golden finches on my new feeder at one time and am totally delighted. The only problem is keeping the feeder full of seeds!!! I love it and so do the birds! I have trouble keeping food in it! Within an hour, my 3 tube feeder looked exactly like the picture. It is so cute to see the little finches lined up in rows on the perches. This feeder is, by far, the finches' favorite. You won't be disappointed if you purchase this item! I never thought that 24 Finches would be on the feeder at one time but I was wrong. The only problem is keeping seed in it because they eat it so fast. I just may buy another one. This is the best bird feeder I have ever had! I've had a few! Within one hour, our feeder had 17 goldfinches. It does need daily refill, but it is great to watch! I received my order in great shape (packed well) and it was sent out right away. Yes I will order again and thank you for the fast service! I bought 3 types of feeders and the finches have chosen the 3 tube feeder as their favorite! I have yet to see all the perches full at once, but it is only a matter of time. I have to refill this feeder twice as often as the others, and it holds more food than the others. Thanks for the exceptional customer service as well! This is a very nice feeder. It would be nice if it had some type of spacers to keep the tubes from moving closer together with so many birds coming and going from it. We love it and so do the birds. I had always used the sock-type feeders for finches but they would get wet and moldy. This is so much cleaner. It is wonderful to see a dozen or more eating at one time and the unique design of it keeps it clean right to the last seed! I would definitely recommend this product. This is all it promises. Even now there are at least 10 finches on the feeder. At times it really does fill up like the picture. 1st day-no finches, 2nd day-4 finches, 3rd day -11 finches, 4th day-to present is up to 20 finches at a time until the neighbors cat comes around. It is a great product! The finches empty this feeder 4 times faster that the other 3 finch feeders I have. On occasion there have been as many as 30 at one time on the feeder. We love the goldfinch feeder. The birds try to land with 2 on a stick. It is the best bird feeder I have ever owned. The only problem is that the birds empty the feeder in a 3 to 4 days. Thank You! I bought this for a gift to my Dad who has had one for a long time. But it finally gave out and we could not locate one for a few years. Then I came upon your website and ordered one. Dad was really surprised and enjoys watching and taking photos of the finches when ever there is a lot on the feeder. Thanks for a great product! I can't keep it full because the finches love it! When I first saw the picture of this feeder on your website, I thought the photo had been doctored up to look like it was full. But 3 hours after I hung it, it looked just like the picture! A finch on every perch! Thank you so much! My neighbors & I enjoy it. I absolutely love it and so do the birds! Love it! 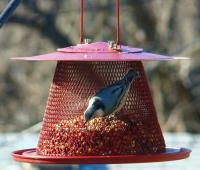 My feeder looks just like the picture shown - full of birds and they took to it immediately. Only problem is keeping it filled! The triple tube finch feeder has brought in the finches where I can see them. This is a nice product! The finches love it, and it's great not to have to re-replenish the thistle so often. This is a pretty basic light weight plastic tube bird feeder. It's most appealing factor is that it accommodates a large number of thistle feeding birds at the same time and require re-stocking less frequently. Although it isn't flimsy, I think this item would be better if it had a more heavy duty construction.